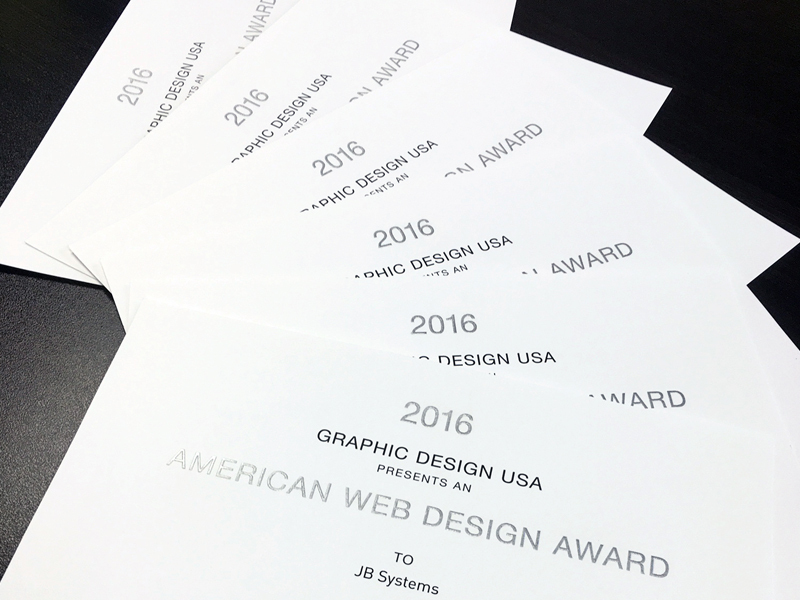 JB Systems is pleased to announce that, for the fourth consecutive year, we have been selected as a winner in Graphic Design USA‘s (GDUSA) 2015 American Web Design Awards. The purpose of the American Web Design Awards, as stated by GDUSA, is to “showcase the power of design in enhancing websites and online communications.” GDUSA was founded in 1963, and is committed to being the leading magazine for creative professionals. We are beyond excited to accept these awards. It reassures us that we are meeting our goal of providing the best services possible to our clients, and it encourages us to stay creative and innovative in our website designs. Here at JB Systems, we often talk to our clients about how important it is for your website to “do more”. Today’s websites need to be fast, functional, and efficient. But what about a website being user-friendly? Fun? How do you keep visitors on the site for more than just a few seconds? How do you get them to click through to multiple pages? How do you direct them to your contact form or get them to add a product to their shopping cart? It’s one thing to have a website that’s capable of doing a lot, but it’s another to get your web visitors to take advantage of it. 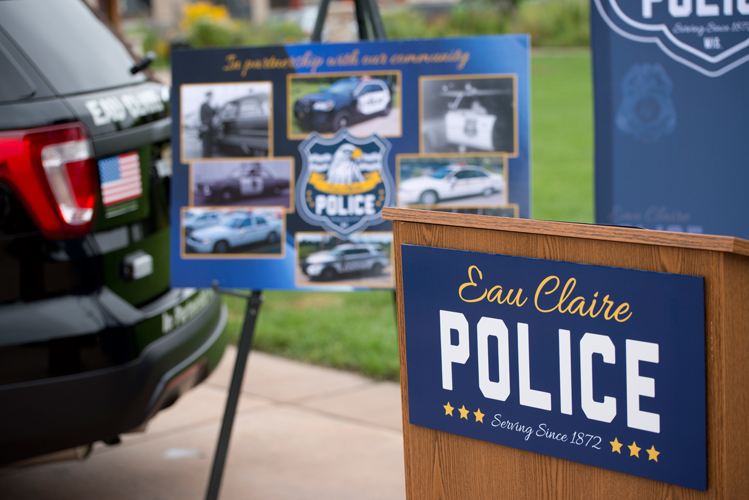 Since our Graphic Design department recently took home three (!) 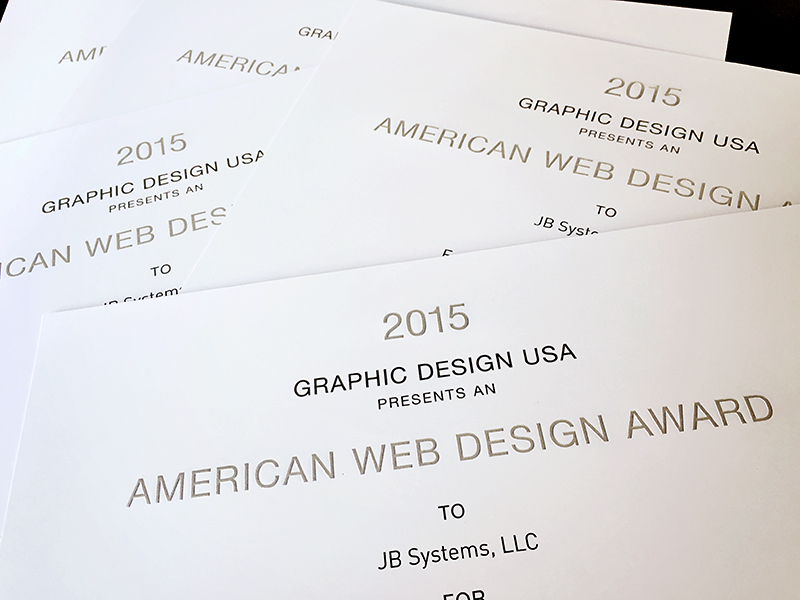 web design awards from GDUSA, and three (!) graphic design awards from GDUSA (still so new it’s not on their website yet), we thought we should give a little more attention to the work they do. You have 3 seconds to get their attention. That’s right. 3 seconds. Having an engaging home page that relates to what the customer is looking for is key to retain each visitor. This can mean rotating promotional banners with special offers, recent news and updates, or the newest images from your photo gallery. Somehow, the look has to catch their attention and let them know that there’s a lot of good information beyond that home page. When your potential customers come to your website, they’re looking for something – a solution to their problems, or information they need. They usually aren’t coming to see how great you are, or how many people you’ve worked for. They just want to know how you can help them with their problem. User-centered design keeps the focus on your customers, and a great designer will help you build your website from the customer’s perspective. It’s important that your website is consistent with the look of your flyers, brochures, vehicles, signage, advertising, and any other materials that portray your brand. Maintaining consistency between all areas of your marketing helps to strengthen your brand. And that means you become more memorable and recognizable. The design of your website has to communicate that brand – through graphic elements, color, photography, fonts/typeface, and even language. The success of your branding is in paying attention to all of the little details. If your website was designed over 3 years ago, chances are it may look a little bit outdated. Not only does technology change quickly, but so does design. There are new techniques, trends, and methods that are used and changing daily. Plus, customers’ expectations of websites are increasingly demanding – they expect that they’ll be frequently updated, clean and simple, and super easy to navigate. And they’re being conditioned to use only the sites that get them what they need the quickest. Refreshing your design and keeping it up-to-date with new design trends that fit your business is part of telling your customers that your business is also up-to-date. Printers, Sign Makers, Promotional Companies – Oh My! We work with vendors of all types, working to find the best service, quality, and pricing that’s out there, while taking the pressure off of you to get the final product done exactly the way you want it. JB Systems also provides identity design (logo design) services. A great time to update your logo (if you are looking for this) would be as you’re introducing a new website – a great way to launch your new look to the world! No matter where you’re starting from, we’re confident we can help get you to where you want to be. Check out the links below to explore our services, or to meet with our designers about your project! Contact us to talk about your graphic design and/or branding needs. Already a Client of JB Systems? Thinking of a redesign? Talk to us about updating your website look!